New images of Windows Phone 8.1 have just started making the rounds online, and this time they reveal a re-designed Windows Phone Store. 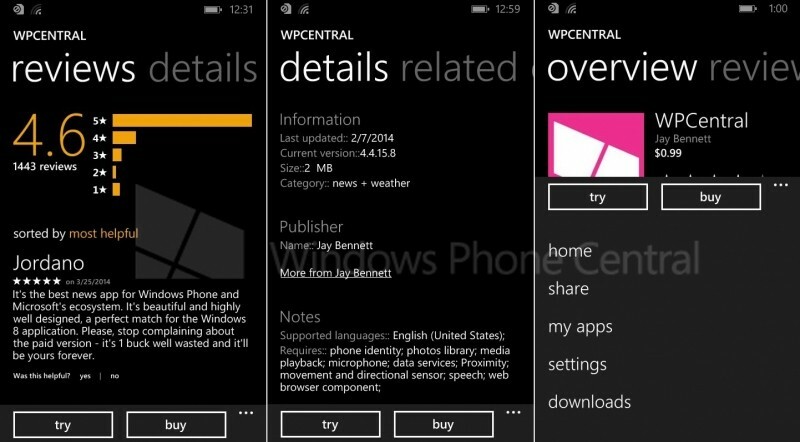 According to a WPCentral report, the "Featured" tab will now be the first thing users see in the new Store, displaying a selection of popular apps at once. A "Personalized" section would contain app recommendations based on your history, likes and interests, and you would be able to easily dispose of any unwanted recommendation using a ‘not interested’ button. The leaked images also show a "Quick Links" section with different categories like featured apps and games, as well as top paid and free apps. The "Categories" section now has general games, entertainment and lifestyle apps. Individual app pages will be divided into Overview, Reviews, Details and Related sections instead of the current arrangement showing Details, Reviews, Screenshots and Related tabs. The ellipsis menu will contain shortcuts to the Home, Share, My Apps, Settings and Downloads sections, while app screenshots are now merged below the app description, and details such as language, version number, last updated will be on a separate page. Lastly, the update brings dedicated sections for checking updates, seeing active downloads, app updates (including options for automatic updates), and more. The leaked images are from a slightly older build of Windows Phone 8.1 and the final design for the RTM release may contain some changes. The update is expected to be officially unveiled at the Build conference in April, and will be released to all current Windows Phone 8 users soon after.